Striking semi-manuscript school-girl map of the Eastern Hemisphere. An unusual and beautiful semi-manuscript map of the eastern Hemisphere dating to 1823. 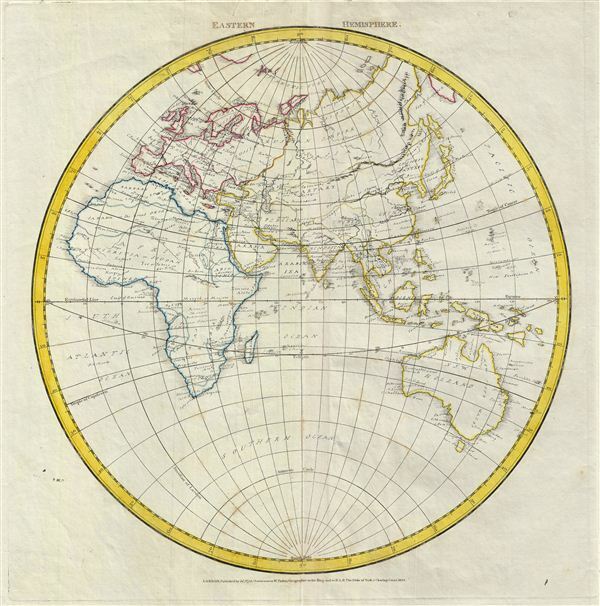 The printed portions of this map follow the cartography of James Wyld and include the basic outlines of the continents, latitude and longitude lines, and the equator, the tropics, the arctic and Antarctic, and the Meridian of London. The remainder of the map, including all textual labels and color work, had been completed in manuscript, that is to say, hand drawn. Wyld most likely produced this map intentionally without labels for use as a classroom workbook by which children could learn geography by filling in the blanks. The manuscript geographical data and detail throughout is altogether outstanding. The work is completed in a fine hand adept at decorative text and the rendering of rivers and mountains. The geography follows the conventions of the period. europe is well an accurately mapped – as is common. Africa features notations regarding numerous indigenous groups throughout – including the Hottentots, the Yahoos (Gulliver's Travels anyone? ), the Bambara, and others. The Nile flows from the speculative Mountains of the Moon, the Niger is mapped only tenuously. In Asia, the Great Wall of China is identified, as are several mountain ranges (not the Himalayas) and rivers. The sea between Japan and Korea, whose name is disputed between the two countries, is here identified in favor of Korea as the 'Sea of Corea.' Australia appears as New Holland though the British colony of New South Wales and the city of Sydney are noted. Very Good. Partial manuscript. Original centerfold. Platemark visible. Minor verso repair, upper margin. Wide margins.